The other morning I woke up to the strangest sound: a rooster crowing. And I thought – “Now what has my neighbor gone and done – gotten a flock of roosters again (as he did a couple years ago)?” There’s just not much sense in that. But this crowing sounded too close to be floating over from a few hundred yards away. No, this rooster was on my farm. But we have a flock of laying hens! We even paid a little extra for “sexed” chicks, which means some sexing-expert in the hatchery had the pleasure of looking at a bunch of tiny, newly hatched chicks, and the privilege to decide which were male and which were female. I don’t want to think too long about where all the poor little males go. But we needed chickens to help fertilize our fields, and our community needed a source of good, clean eggs to eat, and a flock full of roosters only leads to fighting. So we requested just the females, please. Now, as you might imagine, it’s not so easy, even for Sexing-Experts (isn’t that just a fabulous title? ), to tell male from female with tiny little chicks. In addition, hatcheries generally include an extra chick or two in an order, in case there is a mortality or a weak chick or just to boost their customer relations. The hatcheries also seem to throw in a male sometimes, just for good measure. Or because there isn’t much else to do with them. Or because, in fact, a flock can greatly benefit from having one rooster. So I went out to walk amongst our flock and see if I could find this rooster. It isn’t necessarily as easy as one would think to spot the rooster when the chickens are merely adolescents, as this particular flock is. They are about 4 months old, and don’t hit full maturity until 6 months of age. This flock will be laying nicely when markets start up in April. 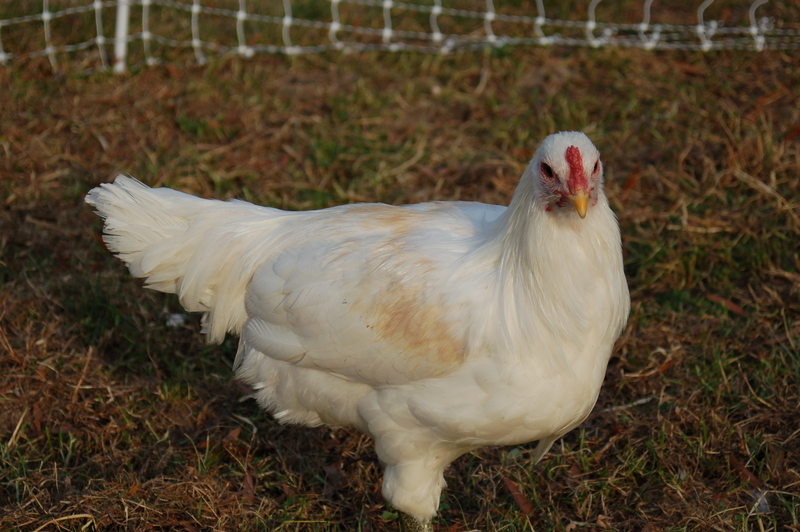 So this adolescent rooster doesn’t have fancy tail feathers or a distinctive comb. But looking closely at my ladies it was clear that one chicken was definitely bigger than all the others. And this one that was bigger is also the one whose legs are green – we’ve been watching that since they were chicks. Now, a rooster, if doing his job properly, is an asset because he will actually protect the hens by herding them under cover when an overhead danger flies through (a hungry hawk – we have plenty of them). 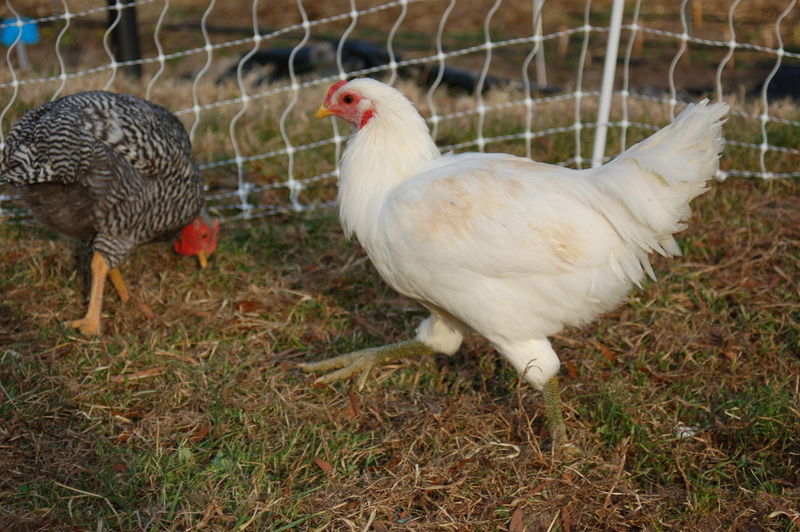 And a proper rooster will indeed make his ladies “roost” at dusk – thus his name. To roost means to perch up off the ground for the night’s sleep, thus being positioned for safety from foxes and other hungry nighttime predators. And so we welcome this rooster. Let’s hope he does his job and tends to the hens’ welfare.